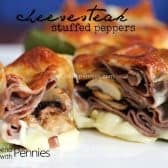 All of the flavors of cheesesteak, stuffed into peppers for a low carb lunch or dinner that the whole family will love! Preheat oven to 375 degrees. 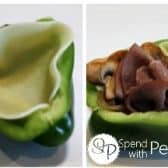 Slice peppers in half from stem to bottom and clean out the seeds and ribs. On medium low heat, cook onions in butter until softened, about 5 minutes. Add mushrooms and cook until the juices are released. 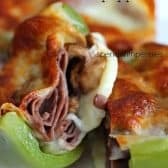 Line the bottom of each pepper half with 1 slice provolone cheese. Add 2 slices roast beef, to each. Divide the mushrooms and onions between all of the peppers. Top with one more slice of roast beef and one slice of provolone. Bake 18-20 minutes or until pepper is softened and cheese is browned.